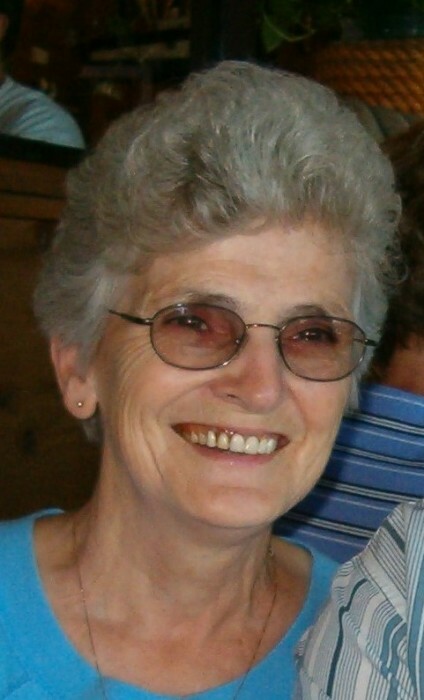 Julie Turner, age 78 of Boissevain, passed away on March 31, 2019 at the Evergreen Place Personal Care Home in Boissevain after an Alzheimer’s long good-bye. Julie was born in Deloraine, Manitoba on August 16, 1940, youngest daughter of Octaaf and Harriet (Arnold) VanMackelbergh. She attended school in Deloraine and on March 21, 1959 she married Thomas (Rae) Turner in Deloraine. Julie worked as an MTS operator following high school, as a housekeeper after the closure of the MTS office in Boissevain and as maintenance for Canada Customs at the Boissevain Port of Entry where she retired. Her life-long occupation was Rae however, to whom she was completely devoted. Julie’s passion was her family and she was always involved in their activities. Grandchildren and their talents were a special source of joy for her. She took great pride in her home and garden, especially her flowers and apple tree, and her pastimes included figure skating, curling, knitting and ceramics. For many years, Rae and Julie enjoyed travelling south in the winter to explore various destinations. She loved animals and was often teased that her pets were granted more privileges than her children. Julie’s nature was sensitive and reserved but she knew how to laugh and have fun as well. She worked hard, lived with integrity, loved and was loved and leaves us with memories of a life lived well. Julie was predeceased by brothers Edward, Donald, Lorne (Doris) and Lee, and sisters Laura (Eugene) Luptak, Marjorie (Henry) Dingwall, and Shirley (Bruce) Greenwood. She is survived by her husband Rae, children Kim (Tom) Turner-Maxwell, Brad (Leslie) Turner, Todd (Lynne) Turner and grandchildren Braeden and Dylan Maxwell, Weston (Kaylah) and Nicole Turner, Kyle and Brett Turner. Julie is also survived by her sister Dorothy (Ross) Hainsworth, twin brother George (Betty) VanMackelbergh, brother Robert (Donna) VanMackelbergh and many nieces, nephews and cousins. Cremation has taken place and a family service will be held at a later date. In lieu of flowers, donations can be made to the Evergreen Place PCH Sensory Room. Special thanks to Dr. Nell and the Evergreen Place PCH staff for the care and kindness they extended to Julie and her family though the years.